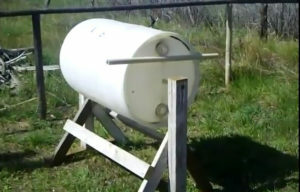 This video shows the build of a simple off grid washer machine which can also act as a composter.If you thought the only way to wash clothing off grid was to take them down to the creek and beat them against a rock, think again.All you need in order to build this washer is a plastic barrel, some pipes, and – you guessed it – a wooden frame. The frame is meant to support the barrel and keep it from rolling away. You’re going to use the pipes to attach the barrel to the frame, as well as to create the lever that helps you wash the clothes.